Of course, the first method that you can use is just simply restoring the whole backup, including your SMS messages to an iOS device, such as an iPhone or iPad. This will overwrite all of your data, though, so be prepared to lose anything that you saved on the device between now and your last backup. 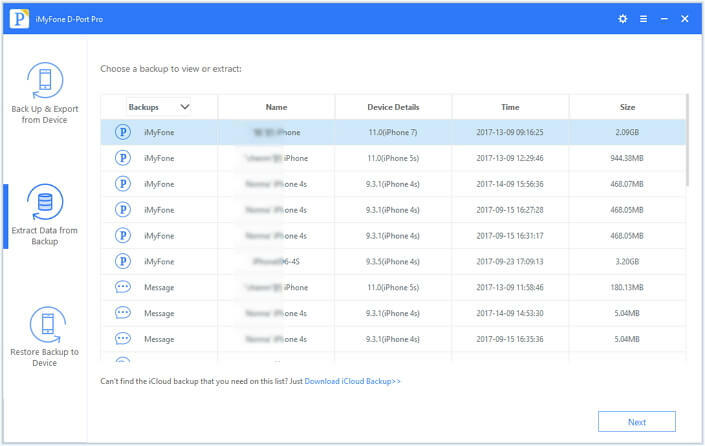 If you want to extract SMS from iPhone backup by this method, just refer to Apple's instruction on how to restore your iPhone, iPad, or iPod touch from a backup. Let's say you don't want to restore the whole backup, though—for example, because it would take too long — or maybe you don't have your device on hand. What do you do then? 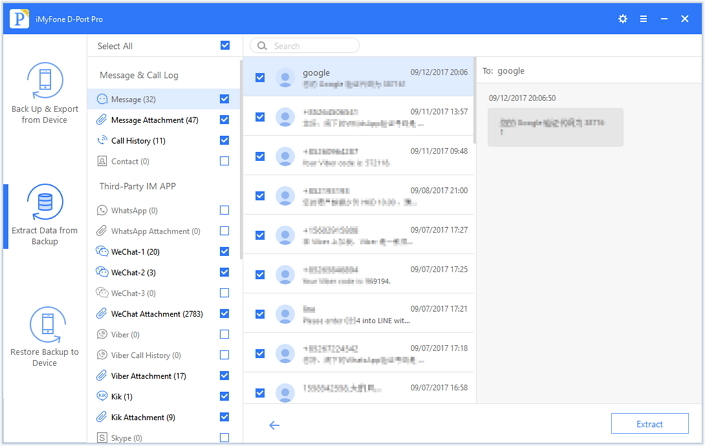 How do you access or extract your SMS messages from a backup? Extract your messages from different iTunes or iCloud backups. You can restore your backup selectively without affecting any data on your iPhone. You can extract all kinds of data (more than 18 types) from your iTunes or iCloud backups. It works with the new iPhone X and iPhone 8. It is one of the best iPhone backup and restore tools on the market, with a lot of free features for all users. (1) Download and install iMyFone D-Port Pro on your computer, then connect your iPhone to your machine. (2) Open D-Port Pro and click where it says Extract Data from Backup, then you will see a list of various backups that you can use. Scroll through them and see which one you want to extract SMS from. Select an iTunes backup from the list and click Next. (3) Under the data types, choose Message as the data type you want to extract. 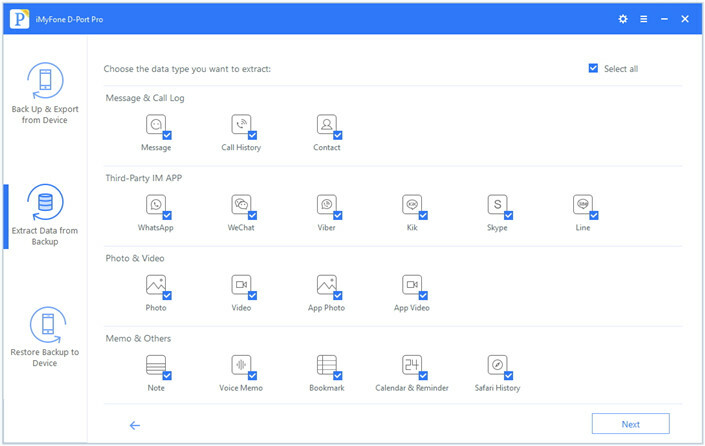 You can choose multiple types of data, also. Then click Next. (4) On the next screen, preview and choose the specific messages you want to extract, then click Extract. (1) Launch D-Port Pro. (Assuming you have already downloaded the software from the official website and installed it on your computer.) 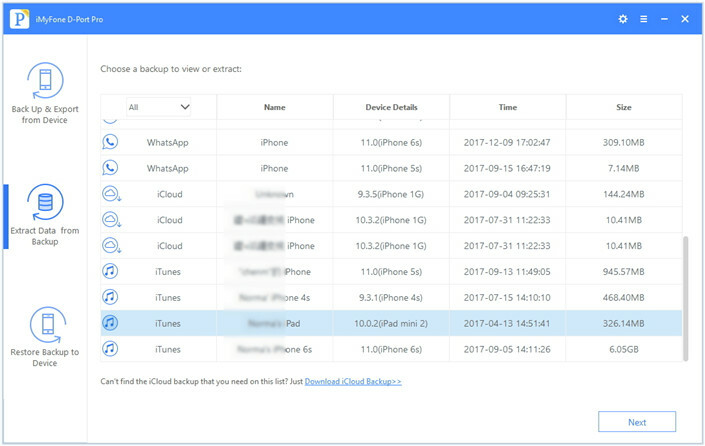 Click Extract Data from Backup, then click Download iCloud Backup. (2) Input your Apple credentials to access your backup. You will then see a list of your backups on the screen. 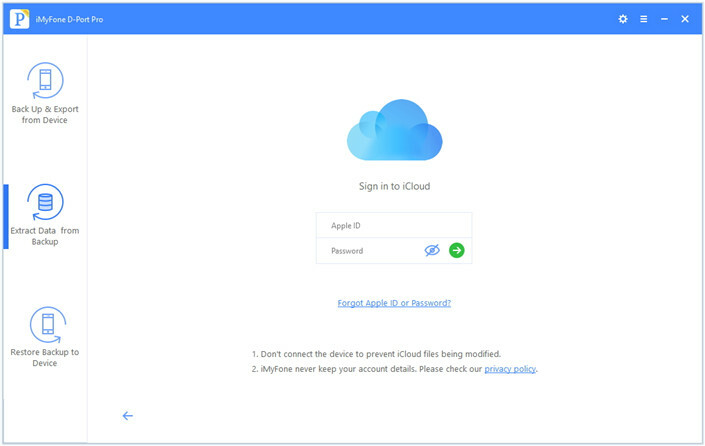 Choose your desired iCloud backup and click Next to choose the data type you want to extract. (3) Click Message on the screen with the listed data types, then on the next screen choose the specific messages you want to extract and click Extract. As you can see, it is possible to extract just your SMS messages from a backup. While you won't be able to do this using standard Apple tools, it's fairly easy to do if you just use a powerful third-party application like D-Port Pro. Don't forget that iMyFone D-Port Pro also offers a lot of free benefits to both Windows and Mac use, for example selectively back up your iPhone free of charge. Download and try it now! What to Do When You Get a New iPhone?